Caution: The information contained below is not intended to give legal advice to any individual. The information is extremely complex and may not apply to your particular situation. Our office strongly urges you to consult with Mr. Young before relying on any information contained herein. You need not feel embarrassed regarding bankruptcy. It is not a loophole in the law but, instead, is a Constitutional right created in 1776 to help people make a new financial start for themselves. Be grateful that you live in a free nation that makes a second chance possible. People as diverse as Thomas Jefferson (our third president), Abraham Lincoln (our sixteenth president) Walt Disney, P.T. Barnum (circus owner), Dorothy Hamill (professional ice skater), Milton Hershey (chocolatier), Rembrandt, John Bobbitt, Samuel Clemens (Mark Twain), Francis D. Nixon (brother to Richard Nixon), King Phillip II (King of Spain 1556-1598), Buckminster Fuller, John Audubon (naturalist), Jerry Lee Lewis (entertainer), Larry King (radio personality), Melba Moore (actress), Wayne Newton (entertainer), Barry Manilow (entertainer), Burt Reynolds (actor), and Toni Braxton (singer) have all been bankrupt. 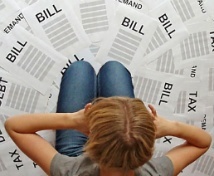 You should understand that there are some debts which are not dischargeable in bankruptcy: these include, but are not limited to, alimony, child support, debts relating to alimony, certain taxes, debts arising out of a fraudulent transaction, and student loans that do not represent an undue hardship. There are two principal ways to file personal bankruptcy. The first and most common one is called “Straight Bankruptcy” or “Chapter 7”. Under this type of bankruptcy almost all debts are wiped out completely. You will be allowed to keep your home in which you live so long as the acreage upon which it sits does not exceed ½ acre in a city or 160 acres in an unincorporated area. Naturally, you would need to keep paying your mortgage. Of course, there are exceptions to everything and your circumstances may differ. Chapter 7 is filed in about 70-80% of the cases because it typically takes only 4-6 months for a discharge to be entered and generally results in no loss of assets and no payments to creditors. The other (less common) way for a consumer to file for bankruptcy would be by filing a Chapter 13 petition in bankruptcy. This is a personal re-organization plan for bankruptcy. Under Chapter 13 you will have to pay back a portion of your debts over the next three to five years. The advantage to this method is that you will be able to keep all of your personal property even if it exceeds the sum of $1,000.00. The portion of your debts that you will be paying back over the next three years may be as low as 10% of the amount owed. If you choose this way to file bankruptcy, you will have to make regular monthly payments to the trustee. While it may seem advantageous to be able to keep all of your property, you would still have to pay to the trustee the present value of that property over the next three to five years so there is no net gain to filing under Chapter 13. People that file Chapter 13 primarily do so to save their homes from foreclosure. In this instance, you would be able to catch up on all of your mortgage arrearages over the full length of your reorganization plan, which would effectively stop a mortgage foreclosure. In addition, you could eliminate some second mortgages and HOA/Condo liens on your home. There is also a mortgage modification program available to you both in Chapter 13 and Chapter 7 bankruptcy. Many people (approximately 80%) have been able to modify their mortgages in this program. In order to use the liberal exemptions of the State of Florida, you must have lived here for at least the 730 day period (approximately 2 years) before we file your petition. If you have moved to Florida within the 730 day period then your exemptions will be limited to those of the state where you lived for the greater part of the last 180 day period (approximately 6 months) before the 730 day period. If you have moved to Florida within the last 1215 days (approximately 3 years, 4 months) then the equity (the value of your home after deduction of all mortgages and equity loans) will be limited to $125,000.00 (possibly per debtor). In addition, there may be other reasons why your protected homestead would be limited to $125,000.00 of equity and these could include: conviction of a felony for a previous abuse of the bankruptcy law, violation of security law or a criminal act or intentional act causing serious personal injuries or death to someone else in the five year period before you filed for bankruptcy. In addition, if within the last ten years you made a fraudulent conversion of an asset to avoid losing it in bankruptcy, your homestead may be denied. The new bankruptcy law requires the use of “means testing”. This is a determination to be made by us and then reviewed by the U.S. Trustee’s Office as to whether you have the ability or the “means” to pay some of your bills back. “Means testing” applies if you are primarily a consumer debtor. However, if the bulk of your debts are from business debts, then “means testing” may not apply. Many people will be exempt from “means testing” if their income for the last six month period falls below the median income for a person in Palm Beach County. The median income will vary from time to time. It is currently approximately $45,703.00 per year for an individual and approximately $56,759.00 for a family of two. As the number of your dependents increases, the income limits likewise increases. If your income is currently above the median we will have to determine if, after payment of all secured debt (automobile loans, home mortgages, boat loans, etc. ), child support, and living expenses as limited by the Internal Revenue Service, your remaining income is greater than 25% of your debts divided by 60 (the number of months in your five year repayment plan), or the sum of $100.00 to $166.00 per month. Of course, this is a very complex and time consuming process. The test is to see whether you can pay between $100.00 and $166.00 per month towards your credit card debt. If you can, then we would have to file your bankruptcy under Chapter 13 of the Bankruptcy Code which would require a 5 year partial repayment plan. After the plan is completed, the remainder of your debts would be eliminated. One of the other changes of the bankruptcy law is that you will be required to undergo mandatory consumer credit counseling which can be done over the internet, by telephone or in live classes. This requires approximately 1 hour of your time and generally costs $50.00. After we have filed your case you will have to undergo additional credit counseling within 45 days of your Meeting of Creditors which will take two hours and the fee will also be $50.00. If you own a home and claim it as your homestead, you will be allowed to keep $1,000.00 of personal property (furniture, money, stocks, household goods, jewelry, etc.) and $1,000.00 of value in a motor vehicle. In addition, if you do not own a home, and do not claim a homestead, you will be allowed to keep $5,000.00 of personal property. For example, a husband and wife, together, could be able to keep $2,000.00 of personal property, $2,000.00 of motor vehicles, and an additional $10,000.00 of personal property if they do not claim their home exempt. These prices may not seem like very much to you but the amounts listed are liquidation, auction or “garage sale” prices. Bankruptcy will remain on your credit report for ten years from the date of filing bankruptcy. However, you should understand that a bad credit rating, without the filing of a petition in bankruptcy, would remain on your record for seven years. There may be hearings involved under either Chapter 7 or Chapter 13. Under Chapter 7, a meeting of creditors is held between 20 to 40 days after your case is filed. At that time, your creditors will have a chance to meet and ask you questions. As a practical matter, the creditors usually never appear and, instead, a trustee will ask you questions for approximately five minutes regarding your bankruptcy schedules. Under Chapter 13, there are two court appearances. The first is the meeting of creditors, similar to the one outlined above. The second hearing is the confirmation hearing. However you will seldom have to appear for your confirmation hearing. At the confirmation hearing the judge will either approve or deny your reorganization plan. If you choose to file Chapter 13, then Mr. Young will explain these details to you. It is most important that you be prompt at all court appearances. The location for all meetings of creditors is the Flagler Waterview Building, 1515 North Flagler Drive, 8th Floor, West Palm Beach. The location for any court hearings is currently the same.